Corneal collagen crosslinking (CXL) is the only treatment available that can help decrease the progression of KC. In the standard "epi-off" CXL procedure,the surface epithelial cells of the cornea are first removed over the entire 9.0 mm central area of the cornea. Riboflavin drops the are administered to soak into the cornea. The UV-A device, set at an energy level of 3.0 mW, is then used to activate the riboflavin and cause the crosslinking reaction and strengthen the cornea. Using this technique, progression can be slowed or halted in most keratoconus patients. Indeed, studies led by Dr. Hersh have shown the efficacy of crosslinking resulting in recent U.S. FDA approval of this technique. Investigators around the world are looking at different methods of crosslinking. A promising new technique is called customized crosslinking. This procedure is the same as standard CXL, except the treatment area is directed only at the keratoconic cone itself, rather than to the entire cornea. Looking at the diagram below, the green circle shows the location of the standard CXL procedure and the yellow shows the target of the customized procedure. Note how the customized procedure covers a smaller area and is centered on the keratoconic cone. Often in customized crosslinking, a higher dose of UV light is administered with the goal of increasing the stiffening effect on the cone or increasing the topography-improving effect of the CXL procedure. Sometimes a higher power light source will be used (for example 6, 15, or 30mW compared to the standard 3.0 mW). This is called accelerated crosslinking. It is important to know that custom and accelerated corneal crosslinking are not FDA approved. Treatments are still in the early phase and there is limited information on outcomes and safety. What are some potential advantage of customized crosslinking for keratoconus? 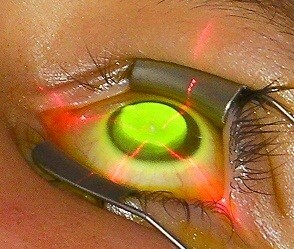 Faster healing: In customized crosslinking, a smaller area of the cornea is treated; so fewer cells need to grow back. This may allow earlier return to contact lens wear and may also decrease risk of infection. 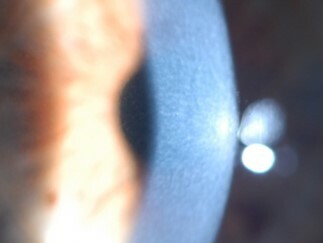 Less corneal haziness: An expected effect of corneal crosslinking is transient haziness of the cornea (see picture below), often with some mild haziness of vision. This is secondary to the changes in the cornea leading to the desired strengthening from the crosslinking reaction. Since we are only treating the keratoconic cone and the cone is typically located toward the bottom of the cornea, the hazy area may not affect the area of the cornea through which you are seeing. 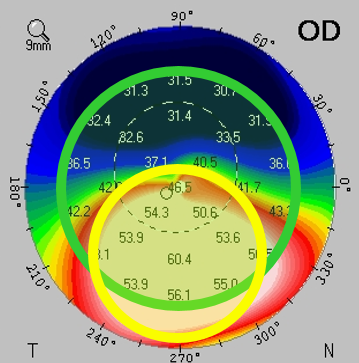 Improved corneal topography with better flattening of the cone: Remember, the goal of corneal crosslinking is to decrease the progression of corneal distortion caused by keratoconus. It is not to improve the irregularity of the cornea or improve vision. However, there are some patients who do note an improvement. We have found in our work that these are typically patients with worse keratoconus. It is possible that by treating the cone directly without treating the remainder of the cornea, that flattening of the cone may be greater (early research reports suggest this in some patients). What are some of the possible disadvantages of customized crosslinking for keratoconus? It is possible that by not treating the entire cornea, that the crosslinking effect will be less and the treatment will not be as effective in decreasing keratoconic progression as standard crosslinking. However, research has shown that the weakening of the keratoconic cornea is centerd on the cone; the other areas of the cornea appear to have normal strength. This would suggest that local, customized crosslinking would be effective in strengthening the cornea where it is weak and decreasing keratoconus progression. Further studies are needed to fully evaluate this concept.